It has been requested that we do a summary of the most important known issues with the current software release for NEEO. I will update this post for every release. Currently, Smart Delays can only be decreased but not increased. User specific increases are being ignored and replaced the actual setting from the database. If the delays for your device are not working correctly, please let us know the correct delays. We are happy to add this to our database so it's even better. This fixes things not just for you but the delays will then work correctly for everyone who owns such a device. Support of Nest is currently disabled, will be reactivated once completely fixed. Reason for this are resulting random issues which seem unrelated to Nest and therefore may cause bugs/reports which can't be reproduced. When using the internal tuner of a TV in combination with an external AVR (Audio Video Receiver) the automatically generated recipe does not turn on the AVR. You can manually correct this by adjusting the recipe. Currently, it is mandatory to assign audio devices to a TV/projector to a source device (i.e. Radio). This does not make sense when you need audio only and not image. This can be fixed by manually editing the recipe after going through the automated wiring. Hi Patrick, just wondering weather the changes in Nest last year for 3rd part controls through things like open hab or smartthing now requires a developer account to gain control has this impacted on the Nest release at Neeo’s end? Don't forget to add bug with disapearing backups after reset!!! I've seen the flickering issue (weird, but minor), and the issue where the initial button presses might not be recognised if you press them without picking up/moving the Remote (a bit more annoying, but can work around it). There a very minor cosmetic issue on the Recipe screen animation. Launch (say) a "Cable" recipe. Press "Cable" to go back to the current recipe. Patrick Since updating brain and remote, the favorite icons for my cable box take an extremely long time to load (1-5 seconds) and each time I swipe back to the favorites pages they have to reload again (taking the long time to reload...again). Patrick this is more annoying than you think, usually when your sat on the couch scrolling through channels you’re holding the remote. After a few seconds it goes to sleep, if any hard button is then pressed it doesn’t respond as you know. A shake of the remote wakes it. But it needs sorting I think a lot of people are going to be frustrated with this bug. I personally don’t mind if the screen would stay dark when only using hard buttons, in fact when I am watching a film using my projector and made the place as dark as possible the light of the NEEO screen is actually quite bright so I find I turn it upside down ... in other words I’d actually prefer it if the remote screen did not wake up when all I did was make a volume adjustment. Shaking or using the touch screen could then light the screen. People have different preferences so maybe you could offer us a user setting on this behaviour of the remote. @Geert Van Der Linden The issue is Greet, if your holding the remote and there screen dims/blacks out the hard buttons become unresponsive until you wake the remote. ultimatly users should be able to customise this for users experience but the bug needs to be addressed first. After the update my hue is not working via my neeo. What can i do?? Is there a known issue with battery life in this release? Ever since updating my remote battery went from lasting a week to lasting 2 days. Today I don't think the remote will last an entire day. I had 93% battery at 8am before leaving the remote unused and undisturbed all day on the coffee table. At 7pm the remote had 31%. The battery was never stellar with a week of very low usage. After the latest firmware the remote battery life has become unacceptable. Update: After a reboot (power+ok buttons) the remote battery shows 36% life. That is a 5% improvement from what was displaying before the reboot. Still not acceptable to lose 60% battery when left undisturbed for 11 hours. Tom H I’m getting around 4 days usage before recharge after the latest firmware update. Prior to that I was getting 7 or 8 days usage between recharges. May give a reboot a go and see if that makes any difference. Here’s my list of problems after the update. Some existed before the update. 1. I no longer have the ability to control my remote via Alexa where before I could turn recipes on and off. 2. Where before my remote would freeze and not boot it now often restarts by itself. 3. Once every few days my remote will start sending commands as if I’m holding down every hardware button at once. This usually results in the volume turning up to max without the ability to stop it. A reboot of the remote fixes this. My remote reboots daily. I just tried to run a recipe (remote was previously in charger and hadn't been used since yesterday) which involves my TV and Receiver and the volume ramped up to the max. I was unable to mute the receiver. First time that has happened. Patrick is this (video attached) what you mean by short flickering? I have this effect since the last firmware update. Patrick as a short update, this does not happen always, and mainly after I remove the remote from the charging cradle. Is this the flickering that you are talking about or is that a hardware defect? I’m experiencing a new issue since the update when I run the Nvidia Shield Recipe it shows the Nvidia Shield controls instead of the TV controls which I’ve selected instead. I have to then back out of and then click on the already running NVidia Shield recipe and I now see the correct TV controls. After upgrading my Neeo Sonos is not working anymore. See screenshots. Rebooting brain, remote and Sonos controller doesnt help. Any suggestions? Jeff For Chromecast, I don't see anything as either 'fixed' nor as 'known bug' -- so I'm wondering if Chromecast pause/play works yet? Mine works for 60 seconds then craps out... I guess I'll soon see if it is any better with the update! Bill Kaczmarek The issue is more with CEC than with Chromecast. I will pull in Patrick so he can update the blog post. Bill Kaczmarek Some background information: The chromecast is quite a challenge when it comes to the HDMI CEC bus. This device seriously over-floods the cec bus and can cause troubles for all other CEC enabled devices. There are already some IP based Chromecast drivers out there which can be used with our SDK. The target is clear, we want to control the chromecast over IP rather then CEC. I can not yet exactly tell when the driver will be integrated though. Bill Kaczmarek Thank you for the update! Did you get to read Patrick response in regards to Chromecast? Jeff yes. They are moving towards IP. Got it. Thanks! Patrick Jeff Happy to say that the Chromecast play/pause is still working for me. LIFX is again useless though. Preparing firmware update for 4 hrs!!!! Downloading images. Brain got 0.50 but remote dont work! Guido Steinhauser Hi! Is your remote still not working? Also, is your remote stuck in a loop or is it completely unresponsive? Jeff now it works. remote stucked in a loop. Bring the remote control near the router or connecting the brain via cable has helped. Guido Steinhauser Thanks for the update. Do keep me posted should anything change :). If your brain was included in a zwave Network and You unplugged IT after plugging IT in again the zwave Network IS Home but your primary secondary Controller say ist still there all zwave device are gone too. Patrick Niels de Klerk can You Help ne how i can exclude IT now???? milo doesn’t the network heals itself? What is your primary controller an what is your secondary? I have to say I’m not an expert on zwave but I think my questions can help to get an idea about what’s happening. Maybe one of the NEEO team can better help you out here. Niels de Klerk the Network heals itself but in the neeo brain everythin IS Home AS Well aus the Button of exclude is away and IT says include neeo into a Network. If I Press reset in the neeo App IT says couldn't reset the zwave Controller If I reset neeo brain completely i still can't include or reset neeo zwave Controller If I reset it neeo brain completely twice/threetimes than i can reset the zwave Controller and include IT again aus secondary Controller. Raphael Patrick Niels de Klerk the question is how do I add neeo correctly to my network. In the manual it is described to use the copy option on the neeo this is not working at all. If I use the include option it works until the power is lost - then Zou have the behaviour as described. Please fix this instantly. If you need further help/logs or whatever please contact me. milo you do realize that I’m not working for NEEO? I was waiting unpatiently for the list feature. But since yesterday I have a Neeo remote working with Roon (unfortunately everything C# based). Christian Riedl did you ported the SDK to C#? Nice! Niels de Klerk Yes, I published it 5 month ago in github, but it seems that I am the only guy in this universe who wans to do it in this way. Christian Riedl the Community with coders is still a bit small so who knows what will happen. It’s great to see that you choose to use your preferred language. And with that opening up the entrance for others. the backgroud of the switches (eg. in a hue widget) apear to change size when switched. The withe area seems to be bigger than the gray one. Or is it just me?! My remote has been stuck in an infinite loop for ove 24 hours since trying to install the latest update. I have rebooted several times and reset the remote once but have been unsuccessful getting it to work. If anyone has any suggestions On how I might get things working again please let me know. Tried resetting the remote again but it boots and then continues to look for a firmware update unsuccessfully. When I tap restart the processes begins again. Christopher Hi Chris! Sorry to hear your NEEO Remote is caught in this weird loop. Can you try to press and hold the power button for 15 seconds. Ignore the options that appear on the screen. When the remote powers off, wait a few seconds and then press the mute button + power button simultaneously until the remote powers up. You will see the recover settings. Press the menu button and begin the recovery process. After I followed the steps you outlined I was able to get the download to finish an get the remote paired again. Everything looks to be working again. Thank you! You all are doing a great job with the updates. Keep um’ coming. Christopher Awesome! Let me know if there is anything else I can do for you :). Patrick I have both the rare and super rare problems. The latter on 2 remotes. Lucky me. Locks up and reboots every day. My family curses at neeo, and me ,daily. I know you guys are going flat out to fix this thing. But this is getting old. Andy solved my devises trouble only to have the updates brake the remote as a whole. Patrick What about a new update? Is something in the starting blocks? Roland Berner I asked Jeff the same question a few days ago - still hoping for a response as to what is currently being worked on for next firmware release. Tom Mandel Then I hope that an answer comes. There are still many construction sites open that should be fixed. Roland Berner Hi Roland! A new firmware update will be released in the next week or two barring setbacks. Tom Mandel Did I not respond? Jeff I did not see a response - unless I missed it. Would you be able to resend it? Jeff Hi Jeff. Thank you for the information. I am very excited. Tom Mandel A new update will be released in the next week or as so long as we have no regressions. Jeff Thank you for getting back to me. I look forward to the continued evolution. Arunas M Firmware is currently with our Beta team. Our target is still for this week, but things can change from one minute to the next :). Aaron Ranson you mean this one? sagdusmir Thank you for sharing this and sorry to see this was your experience. Can you confirm that the lag issue is no longer present? 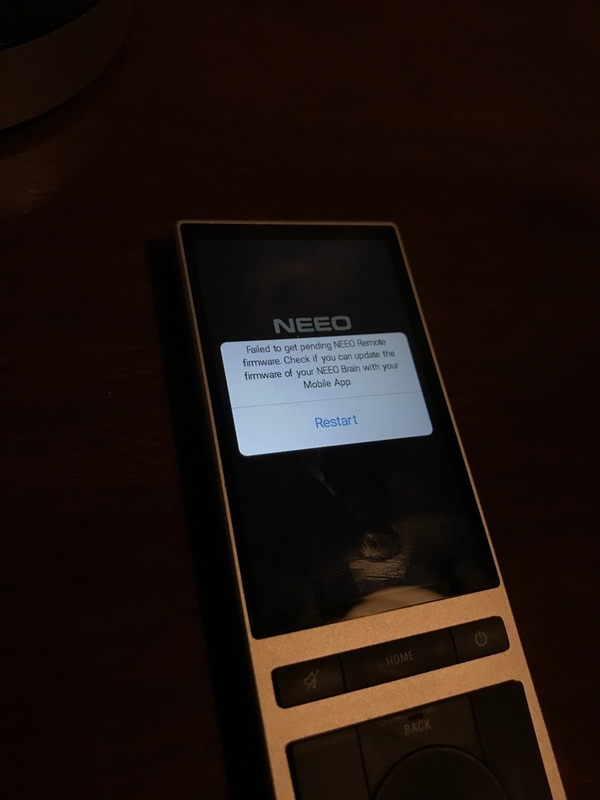 Did rebooting the NEEO Remote fix the flickering screen issue? sagdusmir Thank you for the update. Can you confirm that the protective film was removed from the top of the NEEO Brain? Can you send me a photo of where your NEEO Brain is located compared to your IR controlled devices? Jeff Yes, protective to cover was removed. The Brain is sandwiched between my AVR and my Cable Box, protruding at the front (nearly half the depth of the Brain). External IR booster lying at the bottom front of my AVR. sagdusmir Sorry to hear about your wife, happy wife happy life right? I understand you said it's been working, but what if we place the NEEO Brain directly in front of your IR devices vs sandwiched between them. Can we test this and see if we have any improvement? Jeff i extensively tested the placement. But I can do that again. Can you please explain how that would affect a delay of 5-7 seconds that disappears after a reboot of the remote... or the reboots of the remote? I would like to understand what is happening. sagdusmir It could be a few different things. You mentioned your RSSI is -74, in my experience, this is not good for these types of device that use WiFi to communicate with each other. You also mentioned you have a "plethora" of devices which can also be concerning. The NEEO Brain emits IR from the top in 360 degrees, if the Brain is sandwiched than whatever device is on top of the NEEO Brain can easily be blocking the IR from being emitted. Something else that I discovered last night (but was not affecting me) was that my DirecTv genie had a clear plastic film over the IR area that received the light. I removed it and noticed it was a bit more responsive. The NEEO Brain also has a similar protective film on top of it. I have seen this affect IR in the past and removing it helped solve the issue.